Thanks to Adele's signature falsies and Kim K's spidery fringe, eyelashes are doing a lot more than protecting eyeballs from dust particles these days. 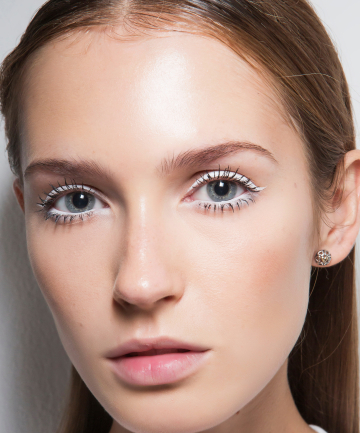 Between Latisse and the eyelash extension craze, who isn't enhancing their eyelashes? But, not everyone who lusts after the faux-lashed look has the time, funds or steady hands to apply these instant come-hither-ers. So, to get bat-worthy lashes, we turn to the most essential of all makeup: mascara. In fact, even if you were born with long, full lashes, a coat or two of quality mascara can be the difference between looking dull and looking fresh-faced, wide-eyed and youthful. However, not all mascaras are created equal. That's where this list of the best mascaras comes in. The best mascara lengthens, volumizes and curls your lashes. It's also flake-free and smudge-proof. On top of that, the best mascara comes with a well-designed brush that doesn't leave a single eyelash without mascara, as well as a formula that doesn't massacre your lashes when you remove it at the end of the night. The best part about mascara (as opposed to say, foundation or anti-aging serum) is that price doesn't dictate quality. In fact, we scoured through thousands of reviews to find drugstore mascaras that readers believe are comparable, if not better than the leading high-end brands. Once and for all, say goodbye to mascara flakes and smudges, and hello to gorgeous, long, easy-to-come-by lashes. The Loreal Double Extend waterproof Mascara is the best I have ever found. The Primer is free with it and I cannot use a Mascara without it. It makes all the difference. I had some of the longest eyelashes in high school but that has been many years ago. This mascara makes my eyelashes look almost as long and voluminous as they were then. I was just thinking of the only mascara we had back then, the Maybelline dry mascara in the little red sliding palette with the little red brush. It worked pretty darn well too! We have come a long way! It wasn't waterproof, which was a real problem. Back to the Loreal... I swam in it, water skied, even went scuba diving in it and was under the water for 30 minutes, cried in it and allergies at times have left my eyes constantly wet, but never raccoon eyes! It does not run! The price is unbelievable. I have tried so many other very expensive high end waterproof products but none work as well as this one. At this price, why not try it?! My granddaughter, who is up on the latest in cosmetics was out of her usual expensive brand. I sent her this one. Later on I asked her if she was out of any of her makeup and she said yes , could I please get her the same mascara I got her before? Really, I think it is THE BEST! I wear contacts and have bad allergies and never have had a problem with it. Does not irritate my eyes either. I get many samples of other mascaras. I try them out at home first and most of them fail miserably so I never wear the out. Back to Loreal Double Extend...my all time favorite! I've tried most of these and they are very good! I love this list and i love cheap make up that works! The Loreal voluminous mascara does not work one bit. I have very long, black, curly lashes and somehow that mascara dulled them, clumped them, and made them stick straight out. Horrible stuff! I use maybelline falsies currently. It works fine for ME. I used this product every day for a month and If my lashes were any longer they would sweep my sunglasses up and down! worth the money honey!! This is a nice soft natural look. If you want super long lashes, you would have to wait and dry a little between coats yo make them long. It is a good layering mascara. I have tried a lot of mascara over the years and I keep coming back to Maybelline's Define-A-Lash. My lashes, after curling and applying it, reach to my brow bone! Special brush separates lashes in a way other mascaras cannot. It is SO WORTH giving it a try!